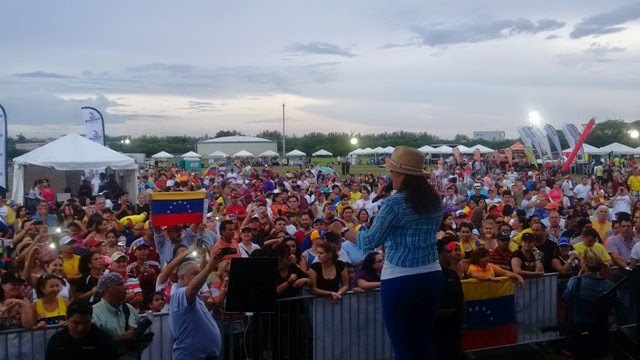 Venezuelans in Doral paid homage to imprisoned opposition leader Leopoldo López Mendoza on Sunday, July 6, 2014. 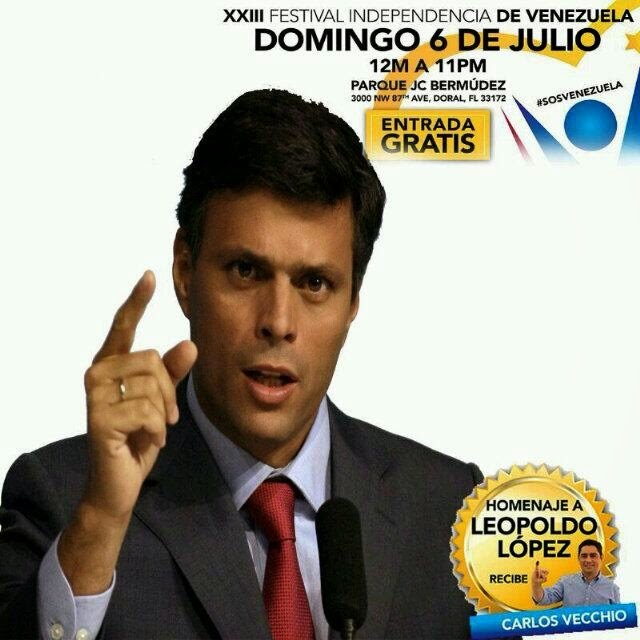 Leopoldo is a prisoner of conscience unjustly imprisoned since February 18, 2014 and faces a political show trial later this month on July 23 in Venezuela before a politicized court that is no longer independent of the executive branch which in this case means Nicolas Maduro and his Cuban advisers. 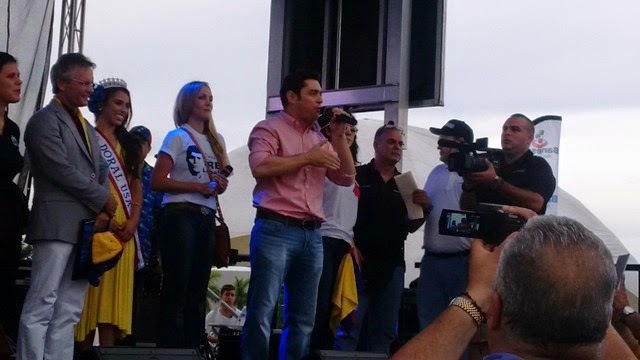 Carlos Vecchio, political coordinator of Leopoldo Lopez's political party Voluntad Popular received a plaque in Leopoldo's honor from the Mayor of Doral, Luigi Boria at the XXIII Festival for the Independence of Venezuela at JC Bermudez Park. Also sharing the stage with Vecchio was the Venezuelan journalist Carla Angola. 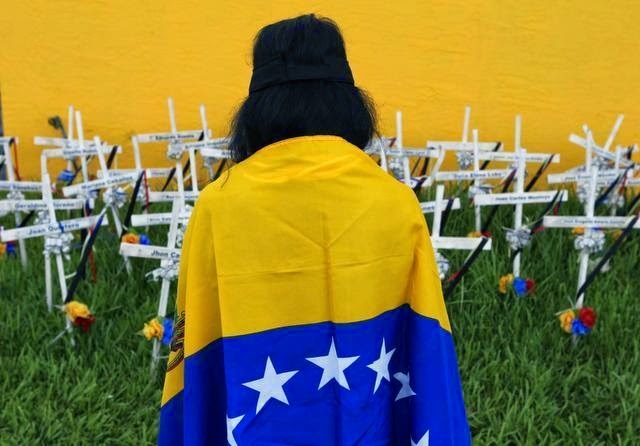 On Saturday July 5 approximately 150 women dressed in black held a silent protest and planted 43 crosses representing Venezuelans killed in the anti-government protests in that country since February 12, 2014. Today I call on the military family, equally to they who put on the uniform w/ a genuine commitment to serve all Venezuelans as well as those who've been carried away by ideology, turning compatriots with different opinions to theirs into enemies. I invite them to read Art 328 and 330 then to undergo a patriotic reflection on whether it is good to see a brother as an enemy for thinking differently. I urge all our military to reflect on the current partisanship, destination of military spending and strategic direction of the National Armed Forces. Partisanship in the Armed Forces, political control has replaced merit, work and efficiency in fulfilling of one's responsibility. [...] The National Armed Forces have stopped confronting groups that plague our borders to take on fictitious enemies: the empire, the bourgeoisie and capitalism. The National Armed Forces are called to follow with patriotic commitment and honor the Constitution. If so, the country will reward them, if not, it will demand it. The full text is available in Spanish here. 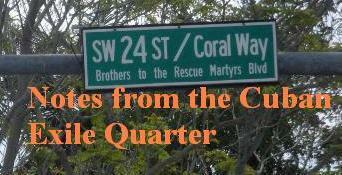 Tonight we also learned that the officials who allegedly killed Geraldine Moreno have been freed while pending trial. 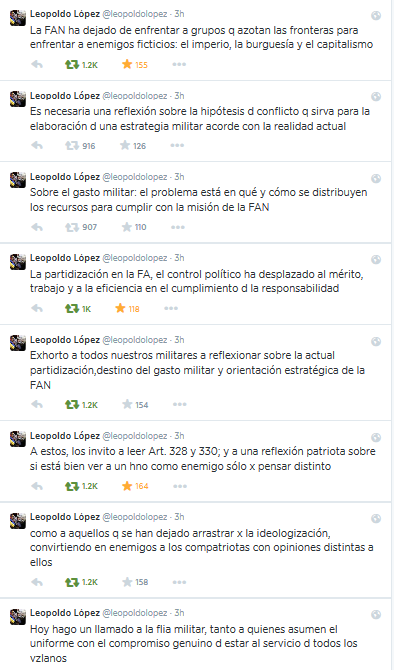 "Leopoldo asked me to make this video reach you about Maduro's "Justice". Please help me with its RT/LT"